So, if you’ve read any of my previous blogs you may have noticed that I have a tendency to exaggerate (lie) about certain things. Like, for instance, that flat tire was entirely my fault (hit the curb), and I like to call myself a writer when I’m really just unemployed. But I need you to believe this one thing – the woman that lives above me is crazy. Now, I don’t mean that she’s a little odd or playfully eccentric. I am afraid for my life. I’ve taken to sleeping with the lights on because I’m sure that she is just waiting to dine on my internal organs. It all began a few years ago when my upstairs neighbour suddenly disappeared. Okay, I was away that week, but try to see it from my perspective. Suddenly there is some strange woman lurking in the apartment above me. Who was this woman, and what was she doing up there? I first began to suspect she was crazy because of the vacuum. Now as anyone who has lived in an apartment knows, there is a certain amount of noise that bleeds through from the other side of the wall. That’s part of the price you pay for not having to cut grass or shovel snow. So, when I heard her vacuuming the carpet at nine in the morning, I didn’t think much about it. When she did it again at noon, I thought it was strange. The third time was at about six, but maybe she’s a messy eater and wanted to get the food off the floor. 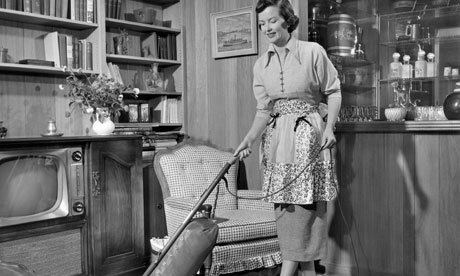 I cannot think of any reason why any sane person would vacuum for the fourth time at ten in the evening. So when she cleaned for the fifth time at twelve-thirty, I started to get a little worried. The only reason to be vacuuming after midnight is to cover up the evidence of a grisly murder. She does this every day! And she’s always moving the furniture. I suspect it’s so she can kill the bugs she imagines are crawling into her brain. Perhaps feng shui is the only thing that quiets the voices in her head, or she’s building her own bowling alley. Either way it’s really annoying when you make a lot of banging noises at eight in the morning on a Sunday when the decent people of the world are trying to sleep in (hungover). It’s one of the reasons I started going for long walks, looking for someplace quiet like a construction site or artillery range. Okay, maybe you think I’m overreacting, but I grew up across the street from a serial killer. That was not a joke, it is absolutely true. You know when they interview the neighbour and they say they had no idea he was capable of such a thing. He was such a quiet boy. Well, not this guy. He was a ticking time bomb, and it showed. The only question was when, not if, he was going to kill somebody. The answer was six months. So to all the people out there, be warned. You never know what people are capable of until it’s too late. Keep your head down and keep quiet, because all the noise is making me crazy. Also, just because I’m passive-aggressive, it doesn’t mean I’m wrong. http://youtu.be/nMqxNPsfN50 I didn’t even mention the guy across the street with the table saw who likes to ruin Saturday afternoon for everyone within a half-mile. I think he’s building an ark. I just assume no one reads my blog, or I would only post recipes. Too much anxiety if you think about it.